Use 16 ounces to every 640 gallons of diesel fuel. Use 16 ounces to every 1,280 gallons of diesel fuel. For best results, add additive before filling tank. The best diesel fuel biocide performance additive, BIO-BLAST kills microbial slime caused by bacteria and fungi that plug filters and cause you unexpected breakdowns. When microbes invade your fuel, reach for BIO-BLAST! E-ZOIL performance additives are formulated for today's Ultra Low Sulfur Diesel. They meet all emission standards and provide added protection for your valuable diesel-powered equipment. 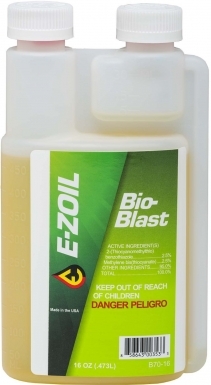 All E-ZOIL diesel fuel additives are safe for use with biodiesel fuel.